Hellebores are herbaceous perennials that bloom early and tell gardeners that winter is giving way to spring. They are a member of the buttercup family, Ranunculaceae, that also includes clematis, larkspur, and anemone and consist of eighteen to twenty species, all of which are good garden plants. The leaves are leathery, palmately divided, and usually evergreen. The flowers are bell-shaped and nodding, and have white, rose, green, or purple sepals surrounding a boss of yellow stamens with petals reduced to inconspicuous nectarines. Hellebores can be divided into to categories based on their growth habits: one group has leaf stems with a terminal flowers (stinking hellebore, Helleborus foetidus), the other group is stemless and has flowers and leaves arising from the rootstock (ex. 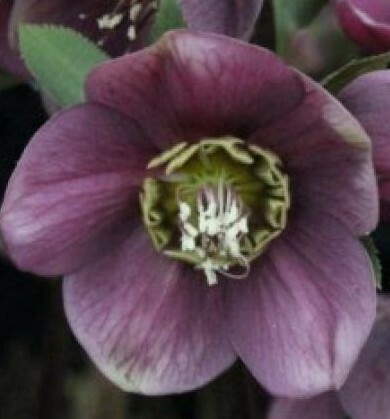 Lenten rose, Helleborus orientalis). The second group is more commonly grown in the US at the present time. 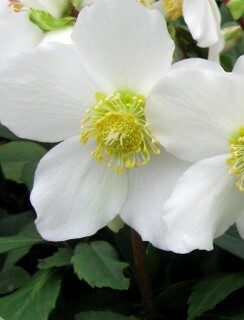 Hellebores like shade and moist, well-drained soil. They are difficult to propagate from seed as they require exacting germination conditions similar to other members of the buttercup family. Most species self-seed and seedlings from underneath existing plants can be transplanted to increase their numbers. Division is possible but difficult. This stemless bushy plant is a native of Corsica and Sardinia where it inhabits dry grassy glades and areas along waterways. 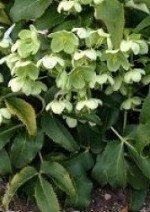 It has very attractive blue-green foliage with thick prickly leaflets and bears clusters of ten to twenty pale apple-green cup-shaped nodding flowers one inch across with a tinge of white. Leaves may burn in too much sun but plants get leggy in too much shade. Short lived but self-seeds readily. Growing on limestone rocks and in woods and brushland this native Majorca is evergreen with blue-green, glossy,mooth-edged leaves with white veins. The light green to pinkish green flowers are carried on pink stems and open flat. The specific epithet, lividus, comes from the Latin word meaning lead-gray/blue-gray, and refers to the color of the leaves. 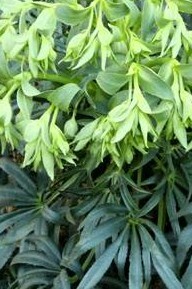 A native of southwest Europe, stinking hellebore grows on rocky slopes, open woods, and roadsides. The dark green evergreen leaves are deeply divided into four to nine toothed leaflets. The light-green, cup-shaped flowers appear on branched stems and are often rimmed with purple. Drought tolerant once established. The specific epithet, foetidus, comes from the Latin for foul-smelling and refers to the odor of the flowers. 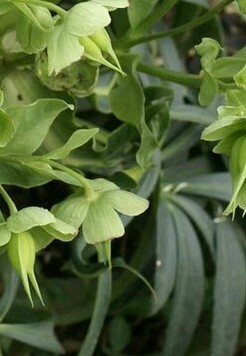 Growing in the woods and sunny banks in northwestern Europe, this deciduous hellebore produces stems with light green leaves comprised of seven to eleven leaflets with serrate margins. The nodding flowers are green with purple markings and are one inch across. With no common name to recommend it, this deciduous hellebore is native to the northwest part of former Yugoslavia where it grows in scrub and grassy areas. The leaves are twelve to fifteen inches across and divided into five leaflets with the outer ones again divided into three, four, or five parts. Three to eleven flowers 1.5-2 inches across are carried on widely branched stems in late winter to early spring. Each flower is star-like, open facing, and may be green to dark reddish purple in color. This popular hellebore is a navit of Europe and western Asia where it grows on limestone soils in mountain woods, sometimes on grassland. It has dark, evergreen leaves that are divided into seven to nine sparsely toothed leaflets and cup-shaped flowers that are up to four inches across. The flowers are usually white when they open but may take on a pinkish hue as they mature. Although the common name suggests that it blooms at Christmas, early spring is more the norm. Several good cultivars are available but all H. nigers are temperamental and more difficult to establish the most other hellebores. The most popular of the hellebores and the easiest to grow, Lenten rose is native to Greece and Asia Minor where it can be found in scrub and on the edges of woods, usually in grassy places. The basal leaves are divided into seven to nine leaflets and are to twelve to sixteen inches wide, dark, leathery, and evergreen. The nodding flowers are three to four inches wide and vary considerablely in color from white to plum and may be spotted. 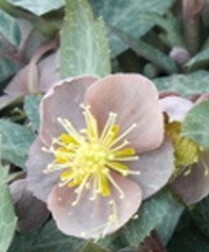 Much hybridizing has been done with hellebores with a focus on H. orientalis. Efforts continue and a great array of color variation is now available including yellow. Double forms that resemble waterlilies have also been produced. Good companion plants for hellebores include pale lavender primula vulgaris, pink Corydalis solida, pink Chionodoxa siehei, blue scillas, blue pulmonarias, early daffodils and snowdrops, ferns, hosta, and foxglove.